Photoreceptors are of prime importance for humans, since vision is one of the most important senses for us. In our daily life, where nearly every action is dependent on visual input, an impairment or a loss of eyesight leads to severe disability. With a non-syndromic prevalence of 1:4000, retinitis pigmentosa, a collective term for a group of inherited retinal eye diseases, represents, together with age-related macula degeneration, one of the main causes for visual impairment and blindness in industrialized countries. The dominant reason for vision loss is, in both cases, the irreversible loss of photoreceptor cells located at the outer nuclear layer of the retina. To date, no effective treatment is available to preserve or regain visual function in affected patients. 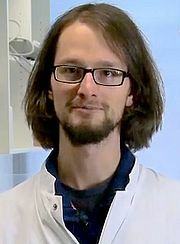 Two examples of recent promising strategies for new retinal therapeutical approaches focus on one hand on the development of gene therapies, where an introduced wild-type allele compensates a mutated gene, and on the other hand on cell therapies, where stem or photoreceptor precursor cells (PPCs) are transplanted to the sub-retinal space to replace degenerated host photoreceptors. I’ve been working the last five years on two different approaches addressing the issue of non-reversible photoreceptor cell loss due to retinal degenerative diseases. On one hand, I investigated new approaches in the field of retinal cell therapy, while on the other hand I studied a gene therapeutical approach targeting prominin-1, a gene involved in retinal degenerative disorders. Following up on initial studies by Peter Gouras et al.1-3 already two decades ago, several recent reports demonstrated that transplantation of PPCs into the sub-retinal space of adult mice results in integration into the host outer nuclear layer (ONL) and formation of mature rod and cone photoreceptors4-7. To date, several studies use heterogeneous cell suspensions generated by dissociation of entire retinae. Consistent for all published studies, in which primary retinal cells were used for transplantation, is the relatively low number of donor-derived photoreceptors that integrated into the ONL of the host. A strategy to increase integration numbers is the enrichment of the cell suspension for the PPC fraction before transplantation. Since the purification of transplantable cells based on the expression of reporter genes will not be an approach that can be used in possible future therapeutic applications in humans, we investigated to purify donor cells by cell-type specific cell surface markers. We were able to show this principle for ecto-5’-nucleotidase, a 70-kDa glycosyl-phosphatidylinositol (GPI)-anchored cell surface molecule, also called cluster of differentiation (CD) 73, which is highly expressed in young rod photoreceptors8-10. In our experiments, we performed magnetic-associated cell sorting (MACS) using antibodies against CD73 to enrich the population of PPCs. Upon transplantation, enriched suspensions of PPCs showed an approximately 3-fold increased integration rate into the ONL of adult mice compared to unsorted or negative sorted cell fractions. With this we could show, that by simply enriching the donor population for the right cell type, the integration rate and therefore a possible therapeutic success of such treatment strategy is significantly improved. Figure 1: Integration of MACS-isolated donor cells into adult retinas. The integration potential of unsorted, CD73-negative, and CD73-positive retinal cells isolated from rhoEGFP/DsRed mice at post-natal day 4 was analyzed after transplantation into the sub-retinal space of adult wild-type mice. Donor cells identified by their expression of DsRed integrated into the ONL of hosts and developed the typical morphology of mature photoreceptors, including a round cell body (D, CB) located at the ONL, an axonal terminal (D, AT) at the OPL, and an inner segment (IS) above the ONL. In addition, most donor cells generated an OS identified by the distinct expression of GFP at the tip of the donor photoreceptors (A–C; a magnification of a donor photoreceptor is shown in D). Whereas the integration rate of CD73-negative cells was comparably low (144 ± 102 cells/ retina; B, E), significantly more cells were found at the ONL from transplantation of unsorted fractions(680 ± 410 cells/retina; A, E). Transplantation of CD73-positive cell fractions increased the number of integrated donor photoreceptors approximately 3-fold, compared to transplantations of unsorted fractions (2199 ± 1006 cells/retina; C, E). AT, axonal terminal; CB, cell body; INL, inner nuclear layer; IS, inner segment; OPL, outer plexiform layer; ONL, outer nuclear layer; OS, outer segment. *P < 0.05, **P < 0.01. Scale bar: (A–C) 50 μm; in (D) 10 μm. Adapted from Eberle et al., 2011. Beside this quantitative approach, I was able to show that the quality of transplanted PPCs is comparable to native photoreceptors by demonstrating, that an indispensable prerequisite of every photoreceptor cell, the outer segment (OS), is developed by transplanted PPCs after proper integration. Importantly, transplanted PPCs develop native outer segments even when not integrated into the host tissue but located at the sub-retinal space, as it is predominantly observed after transplantation into severely degenerated retinas. These results substantiate the feasibility of cell therapeutical treatment of severely degenerated retinas. Eventually, I could demonstrate, that outer segments are not formed properly by PPCs transplanted to the vitreal side of the retina. This suggests an influence of signaling molecules, presumably secreted by retinal pigment epithelial cells into the sub-retinal space, on transplanted PPC final differentiation. Figure 2: Integrated donor rhoEGFP–positive photoreceptors generate outer segments in wild-type host retinas. Upon transplantation into an adult wild-type mouse (A), CD73-enriched photoreceptor precursor cells (PPC) isolated from double-transgenic (rhoEGFP, actinDsRed) reporter animals integrated properly into the host retina and developed the typical morphology of mature photoreceptors, including a round cell body (CB, white) located at the outer nuclear layer (ONL), an axonal terminal (AT) at the outer plexiform layer (OPL) as well as an inner (IS, white) and outer (OS, green) segment located above the outer limiting membrane (OLM, dashed line). On a representative correlative light electron microscopy section (B; B’ is a higher power view of the boxed area in B) rhoEGFP-positive elongated structures could be observed (B’, arrow). Cell nuclei are stained with DAPI (blue). Notably, not every green fluorescent signal in the area of host OSs indicated the presence of biological structures since unspecific signals (B’, C and C’, arrowhead) could mimic the typical signal of a rhoEGFP-positive OS (C, arrow), which was not observable in low- magnification transmission electron microscopy (TEM) in contrast to the contamination (C’, arrow and arrowhead, respectively). RhoEGFP–positive OSs derived from integrated, transplanted PPCs showed the physiological elongated morphology as observed by TEM (D, blue dashed line; E) and the corresponding fluorescent light microscopy image (D’, arrow; as reference points three nuclei were numbered). The boxed areas in E are shown at higher magnification in the respective panels E’ and E”. 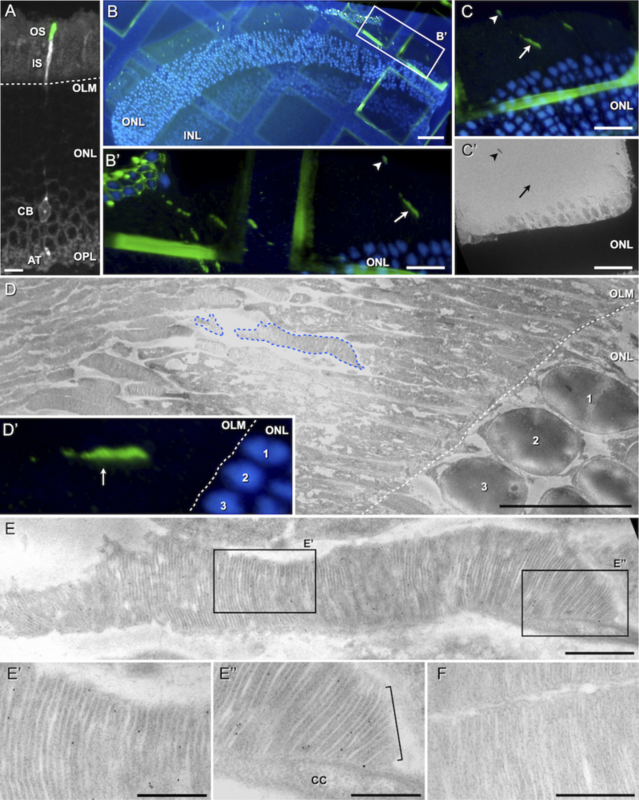 In addition to the formation of a connecting cilium (E’’, CC) the donor-derived OSs displayed growing membrane evaginations at their bases (E”, bracket) and typical densely packed disc membrane staples (E’, E’’) similar to endogenous OSs (F). Scale bars: A: 10 μm, B: 50 μm, B’-C’: 20 μm, D: 10 μm, E: 1 μm, E’-F: 500 nm. Adapted from Eberle et al., 2012. The second kind of approach I was investigating was a gene therapeutical approach to cure inherited retinal degenerative diseases. Several mutations have been reported for prominin-1 to cause retinal degeneration in humans. It is a protein expressed at cell membrane evaginations in a variety of cell types. Interestingly, the prominin-1 knockout mouse is characterized exclusively by disorganized photoreceptor outer segment formation and progressive retinal degeneration. During my work I was able to successfully deliver via adeno-associated viral vector transfer a wild-type form of mouse prominin-1 into the photoreceptors of prominin-1 - deficient mice. I got divergent results showing on one hand a rescue of the thickness of the photoreceptor outer nuclear layer on a short time period (3 weeks post treatment). On the other hand long-term data (8-10 weeks post treatment) suggests histologically as well as functionally a negative effect on treated photoreceptors. With demonstrating an increase of the integration rate of transplanted PPCs using CD73-based enrichment of the donor population for the right cell type we could set another step further towards retinal cell therapy by increasing the effectiveness of such treatment. Furthermore, the demonstration, that transplanted PPCs develop native OS, even when not integrated into the host ONL, substantiates the feasibility of such therapy and sheds light on new possibilities for the treatment of severely degenerated retinas. Gouras P, Du J, Kjeldbye H, Kwun R, Lopez R, et al. (1991) Transplanted photoreceptors identified in dystrophic mouse retina by a transgenic reporter gene. Invest Ophthalmol Vis Sci 32: 3167-3174. Gouras P, Du J, Kjeldbye H, Yamamoto S, Zack DJ (1992) Reconstruction of degenerate rd mouse retina by transplantation of transgenic photoreceptors. Invest Ophthalmol Vis Sci 33: 2579-2586. Gouras P, Du J, Kjeldbye H, Yamamoto S, Zack DJ (1994) Long-term photoreceptor transplants in dystrophic and normal mouse retina. Invest Ophthalmol Vis Sci 35: 3145-3153. Kwan AS, Wang S, Lund RD (1999) Photoreceptor layer reconstruction in a rodent model of retinal degeneration. Experimental neurology 159: 21-33. MacLaren RE, Pearson RA, MacNeil A, Douglas RH, Salt TE, et al. (2006) Retinal repair by transplantation of photoreceptor precursors. Nature 444: 203-207. Bartsch U, Oriyakhel W, Kenna PF, Linke S, Richard G, et al. (2008) Retinal cells integrate into the outer nuclear layer and differentiate into mature photoreceptors after subretinal transplantation into adult mice. Exp Eye Res 86: 691-700. Lakowski J, Baron M, Bainbridge J, Barber AC, Pearson RA, et al. (2010) Cone and rod photoreceptor transplantation in models of the childhood retinopathy Leber congenital amaurosis using flow-sorted Crx-positive donor cells. Hum Mol Genet 19: 4545-4559. Koso H, Minami C, Tabata Y, Inoue M, Sasaki E, et al. 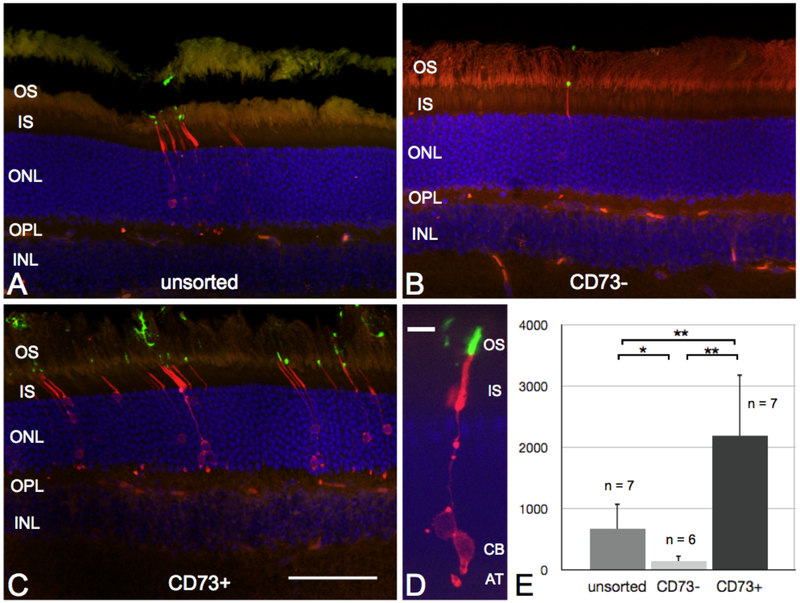 (2009) CD73, a novel cell surface antigen that characterizes retinal photoreceptor precursor cells. Investigative ophthalmology & visual science 50: 5411-5418. Lakowski J, Han YT, Pearson RA, Gonzalez-Cordero A, West EL, et al. (2011) Effective transplantation of photoreceptor precursor cells selected via cell surface antigen expression. Stem Cells 29: 1391-1404. Eberle D, Schubert S, Postel K, Corbeil D, Ader M (2011) Increased integration of transplanted CD73-positive photoreceptor precursors into adult mouse retina. Investigative ophthalmology & visual science 52: 6462-6471.